There are a wide range of umbrellas available for different situations. What should people look for in an umbrella, and what are vendors and products of note? I have been carrying a Hickory Brigg Umbrella for 15 years; the same one and it has been bombproof and reliable. The rain pops off of it like it does off of the tight fly of a pup tent. You feel just as sheltered beneath it. It is stylish and strong enough to defend yourself against a pack of brigands, should one encounter a pack of brigands in the financial district. Agreed, ours are 10+ years and still going strong! They are expensive, but very functional and well made - worth the price. MOMA umbrellas are neat; good cause and nice to have million dollar art keeping you dry. Would love the parrot handle umbrella (James Smith) but alas ours don't keep - tend to lose them. Therefore we tend to be practical and harbor a variety of promotional, albeit benign umbrellas; favorites are school associated. Big is better - nice to feel you have a good wide perimeter from the wet stuff. Automatic a must for single hand operation. Barbour makes a nice compact umbrella that has their current tartan canopy! In my experience, Barbour umbrellas (at least the compact ones) don't last. Mine was ruined in its first storm and when I returned it to Orvis, the staff noted that they have lots of problems with them. Man, I love the "idea" of the full-size, handmade, heritage umbrella with the solid wood shaft and so forth that you buy once or twice in a lifetime. But for me, the exigencies of modern life (travel, cramped spaces, taxi cabs, etc.) seem to get in the way and I end up buying the el-cheapo black telescopic numbers from the nearest pharmacy. One technical comment: I did purchase a tattersall umbrella several years ago from T. Anthony, and I didn’t think twice about this but it had a cloth canopy. Bad decision. It is a bit heavier than the nylon or silk variety (especially when wet) and takes MUCH longer to dry. I would advise folks to pay attention to this detail when purchasing. Queen Elizabeth uses Fulton umbrellas. They make a transparent "birdcage" style which is good for keeping you dry and your perimeter efficient- especially on busy streets. Though they aren't attractive. However you have to sacrifice style for the consideration of others sometimes. It's never nice getting clipped in the face by an umbrella rib. 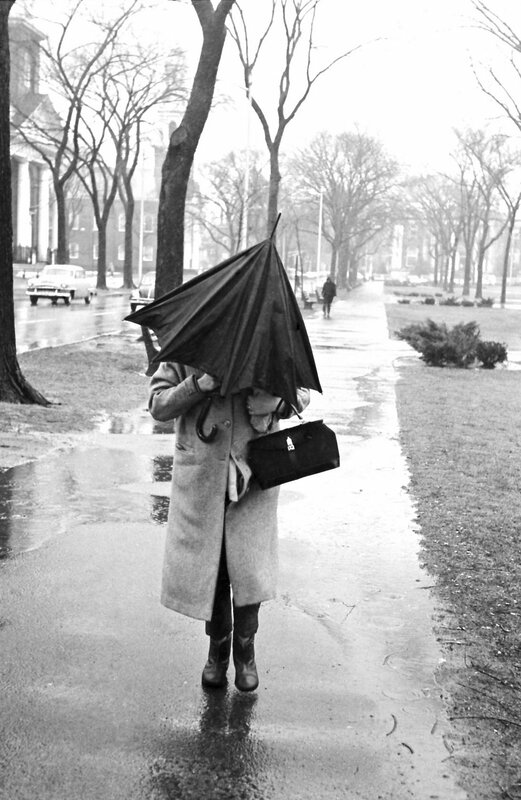 I mainly just grab a golf umbrella out of the Volvo when caught in a "brolly buster". Rain is also good at raising the heart rate when you simply have to dash it! I have a Fulton birdcage umbrella with simple black trim and I think it's a bit cute! Nice to be enclosed in my little bubble on a rainy day. I received a London Undercover umbrella as a wedding gift six years ago. While the canopy is standard black on top, the underside has a black and white map of Central London (it is a two-layer affair). Umbrellas are such a bummer. Useless in a blow, wet and annoying on the train and running errands...I want to like them, but had to break up with them in favor of hats and hoods. :-) I have graduated to a white poplin bucket hat with a grosgrain band, which my kids tease me mercilessly about.